My best friend, Christine, is proud to admit that she is a shopaholic. She knows all the best spots to shop for any occasion. She knows how to pace herself by tying in music and craft events for diversion, and she wines and dines along the way to easily fill an entire day with everything she enjoys. She’s a pro shopper but she was kind enough to allow a novice like me to tag along. Last summer, she invited me to join her for the Downriver Fest, which celebrates the environmental, cultural, and economic impact of the Mississippi River and the land it built through live music, cooking demos, panel presentations, food booths from local restaurants, and walking tours. What fun! The Gulf shrimp tacos were to die for! So much to see and do and we can’t wait to go again this year on September 8th to explore this year’s theme, two things we adore: “Gumbo and Daiquiris." After that, we wandered through the French Market’s diverse community flea market and found treasures from around the world. We bought gifts for our friends and even did a little Christmas shopping. They had clothing, art, jewelry, crafts, and souvenirs for every taste and budget. Saturdays offer a truly local experience with a bustling market full of carefully selected handmade artisan food, arts, and crafts. 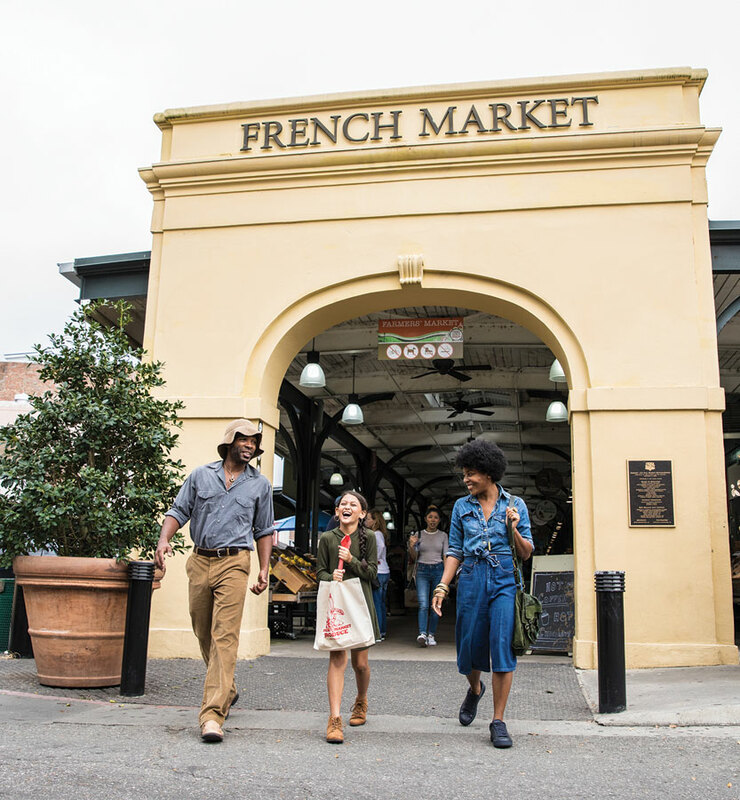 From grab and go foods to local wearable art, the market is full of locals catering to locals and tourists alike and is one of our favorite places to shop. With a frozen daiquiri in hand from Organic Banana, we strolled down to the crafts bazaar on the 1000 block of N. Peter’s Street and discovered handmade silver at Lalosh Silver, bought a Panama hat and some handicrafts from Latin America at Latin’s Hand, and marveled at artifacts and carvings from Africa at Motherland African Art. Continuing down Decatur Street, I found some wonderful Louisiana cookbooks and a book for my grandson, The Three Little Cajun Pigs, at A Tisket, A Tasket. We treated ourselves to one creamy Creole praline each at the world famous Aunt Sally’s Praline Shop, Southern Candymakers, and at Evans Creole Candy Factory and debated the merits of each. Mmm, they are all so delicious! Our favorite one stop shop was Dutch Alley Artist’s Co-Op which features the original works of 25 regional artists. We enjoyed talking to many of the artists about their craft and purchased several items for our homes there. Whew! We needed to take a rest after that roll through the shops, so we sat on a park bench by the fountain to catch our breath and marveled at the beautiful afternoon. The sweet smell of jasmine and beignets wafted by and we could hear a brass band wailing in the distance. The calliope on the Steamboat Natchez could be heard in the distance after the red streetcar rattled down the tracks. We rustled through our newly found treasures and smiled with satisfaction. We glanced at each other and knew it was time to wander along Decatur Street to explore uncharted territory. We popped into Pop City to browse the locally produced clothing, art, books, soap, and housewares. Next, we dove into N’awlins Sports for some Saints gifts for our favorite “Who Dats.” Finally, we indulged ourselves (and our grandchildren) in The Little Toy Shop. It had been a long time since we had laid our eyes on such high quality toys and collectable dolls! Santa is going to bring some extra special gifts this year that will be treasured for many generations. Speaking of which, we looked like delighted elves when we found Merry Christmas & All That Jazz with a wide variety of ornaments and gifts that could only be found in New Orleans. Just when I had almost given up on finding something for my husband, the man who has everything, I spotted Voodoo Harley Davidson! As soon as I walked in, I saw several hats and shirts that were perfect for him. Mission accomplished! We heard some beautiful voices in the distance and discovered the Victory Belles performing in the nearby Dutch Alley Performance Pavillion. This trio of bombshells sang the treasured patriotic music of the 1940s. They charmed us on a nostalgic journey through World War II-era musical classics. We enjoyed a trip down memory lane with their spirited performances of “Boogie Woogie Bugle Boy”, “Don’t Sit under the Apple Tree”, and “Chattanooga Choo Choo,” all sung in rich, three-part harmony. The most heart-warming part was when they went into the crowd to leave lip prints on several veterans and sang to an elderly World War II Veteran. He told them that the song “I’ll Be Seeing You” was the first song he danced with his wife to so many years ago. I don’t think there was a dry eye in the crowd. Ever since, we never miss them when they play to the public. We can’t wait to see them again on July 28th and August 25th from 1 to 2pm in Dutch Alley near the fountain. We followed the sweet smell of café au lait and beignets to Café du Monde, a French Market tradition since 1862. It was time for another shopping break, a delicious pick-me-up, and a great place for people watching. After a relaxing interlude, we walked up the ramp by the Café to the elevated plaza known as Washington Artillery Park for the amazing view of the muddy Mississippi River, Jackson Square, and St. Louis Cathedral. A lone sax player entertained several people on the Moonwalk promenade below. We felt the cool breeze on our faces from the river and watched the Steamboat Natchez plow through the busy waterway. We felt grateful to live in such a wonderfully diverse and historically rich city. As the sun set, Christine and I vowed to return to our favorite bend in the majestic Mississippi River which cradles the French Quarter again soon.